Grammys! Emmys! Golden Globes! Nobel Prize! ESPYs! Every year we celebrate all kinds of accomplishments. Those nominated for the different awards are simply being honored for their hard work and success achieved! Our students also work hard and have been successful… Why not hold an award ceremony for them in the WL class? I will be MC-ing my fourth ceremony on the last day of school in each class. I am going to lay down the red carpet (butcher paper) and get the trophies (paper certificates) ready! Here’s an example of the award certificate I made. I don’t claim to be a expert at writing these – if I worded something weird – let me know a better way! No one has ever proof read these for me. Truly, students learn so much in a whole year of a language class. An awards ceremony celebrates what they’ve done and gives them a fun memory of your class. It only takes a few minutes to do, but ends the year on a high note that the students will remember! Fun! I hold an awards ceremony tied to their final project in my level 2 class. Students must write a short story in the past tense, complete with illustrations. Students vote on their favorite “books”: best overall, best illustrations, best story, best ending, best language. Prizes are awarded the following day. 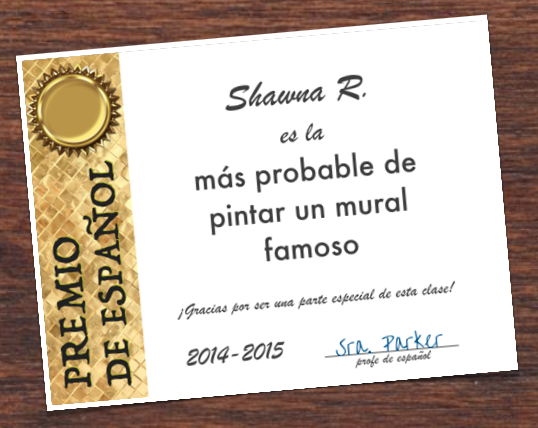 I might use your idea to add in student accomplishments so that everyone gets an award. Thank you! How long is the short story? How many illustrations? It has to be 10 pages, plus title page and an author page. 10 required verbs — 6 must be reflexive. Only five new vocabulary words which they must be define. They have to write what they know. They also need to reflect on the year and see what vocabulary they can pull in to “show off” what they know. At first they groan, but then realize it isn’t that bad. All drafts are done WITHOUT computer access. Once a draft is written, they then can add the design. With these simple guidelines it is AMAZING what they come up with! Oh and the illustrations usually turn out to be 1 / page. They may be computer generated, hand drawn, personal photographs. You name it. Hola! 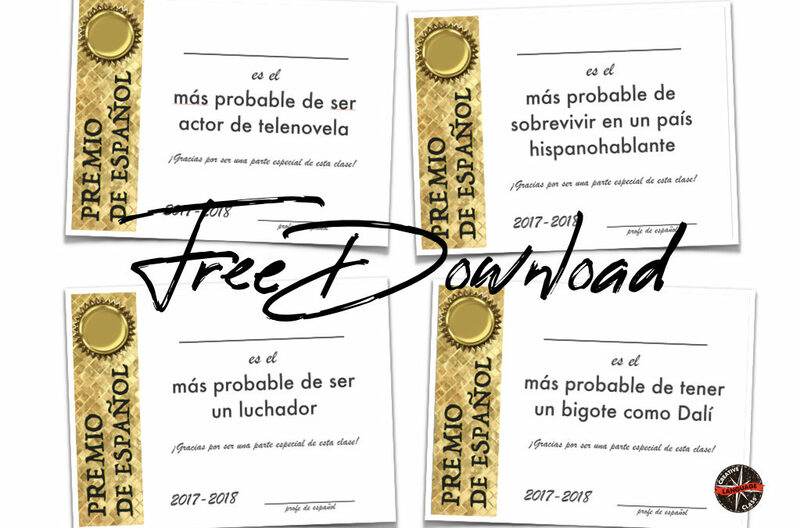 Quién escoge los ganadores? Tú o los estudiantes?? Cada estudiante recibe algo? cada estudiante votó por su amigo sin pensar en quién lo MERECÍA. de vez en cuando daré A dos personas el mismo premio. Espero que no te importe que te corrija. Thanks! It’s nice to have feedback! I’m still “mejorando” my Spanish every day! OMG! You can still fit into your prom gown! I am SO jealous. Haha! 🙂 I love you, Ivonne! This is a SUPER IDEA! I really like this….I don’t see how you can modify it for improvement! 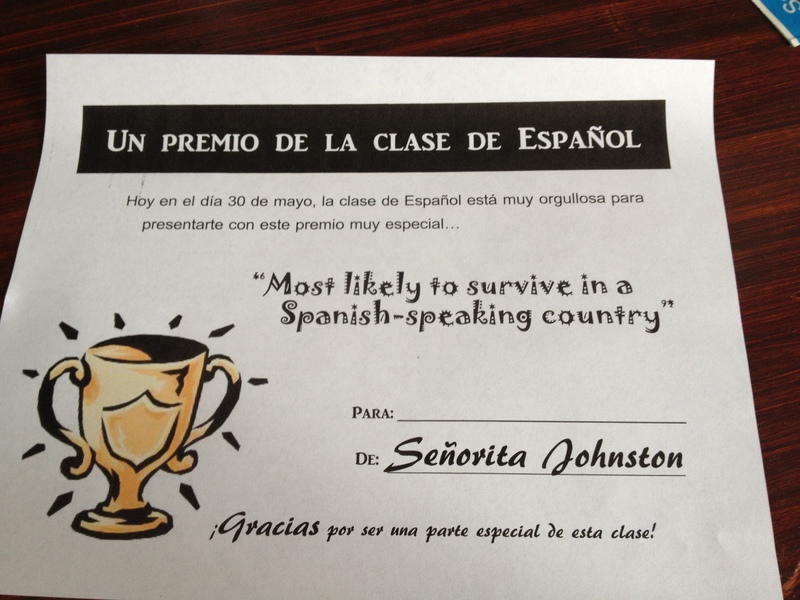 My only question–do you give “multiple” “Most likely…” awards due to the fact that there are 30 kids in a given classroom? How does that affect the distribution of types of awarss? I don’t give an award to every student. Mine are high schoolers and I honestly don’t want to have to reward a kid with a rotten attitude! I do try to make it fun and give credit where credit is due. I throw in some funny ones so it’s not all about grades/performance. All my decisions are based on stand out moments in class and usually when I give the award title, most students already know who it’s going to be. I probably make 10-12 awards per class and give some different ones for each class so there are some surprises throughout the day. Love this idea, gracias por compartir! So doing this since I am moving and would love the opportunity to tell them how amazing they are! Any chance you have template of awards? Hi, Sounds like a great idea. May I ask which microphone app you use? Thank you very much for this great idea. Definitely I will try it next year.